Crossing the Border at International Falls, MN into Fort Francis, Follow Hwy 11 east approximately 18 miles. Turn left onto Hwy 502, continue approximately 80 miles. At the stop sign turn right onto HWY 594, continue to the first stop light. Turn left onto Earl Ave. Continue to the stop sign, turn left onto King Street. Continue to the stop light, turn left on Hwy 17. Follow approximately 28 miles to Vermilion Bay. 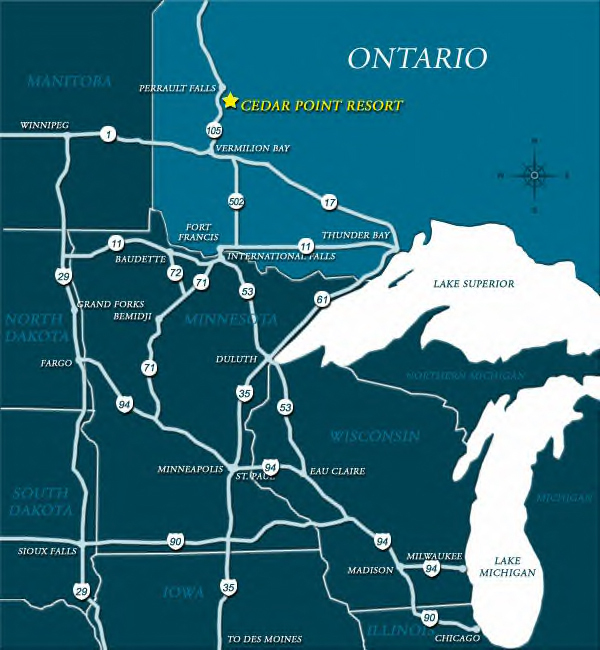 Turn right onto Hwy 105, continue for approximately 30 miles to the Cedar Point Road. Watch for the road sign. Turn right onto the resort road and enjoy the last 5.5 miles of your journey.